NASA’s 21st century return to the Moon will make use of Orion, the space agency’s Crew Exploration Vehicle. Shown here is Orion docked with a lunar lander in orbit above the lunar landscape. GOLDEN,Colorado - NASA is set to roll out next month a U.S. national strategy for lunar exploration,one that outlines both robotic exploration needs and the rationale for sendinghumans back to the Moon. Thespace agency plan is a key component in the response to U.S. President GeorgeW. Bush's Visionfor Space Exploration - a call to action that he sketched out in early 2004. Thatfar-reaching, big picture White House agenda included as a goal the return of humans to theMoon's surface by 2020 - as the launching point for missions beyond. Also,starting no later than 2008, a series of robotic missions would be dispatchedto the lunar surface to research and prepare for future human exploration. Withthe Moon viewed as home for abundant resources, President Bush also explainedthat lunar soil contains raw materials that might be harvested and processedinto rocket fuel or breathable air. "Wecan use our time on the Moon to develop and test new approaches andtechnologies and systems that will allow us to function in other, morechallenging environments. The Moon is a logical step toward further progressand achievement," Bush stated nearly three years ago during a speech at NASA Headquarters in Washington, D.C.
Prospectiveuse of the Moon was high on the agenda at the eighth Space ResourcesRoundtable, held here Oct. 31-Nov. 2 at the Colorado School of Mines and incollaboration with the Lunar and Planetary Institute in Houston, Texas. The need to effectively use space resources "has penetrated deeply in planning for NASA's Lunar Precursor and Robotic Program," said David Atkinson, Deputy Program Executive for the Lunar Precursor Robotic Program at NASA Headquarters in Washington, D.C. "It could become a keystone of our future human exploration", with use of lunar resources helping to enable the settlement of the Moon, he said. 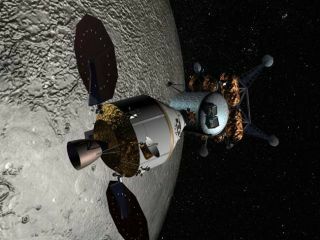 Atkinsonsaid that while NASA's lunar plans are not set in stone, a display of on-the-spotuse of the Moon's resources--also labeled as In-SituResource Utilization (ISRU)--is forecast in about the 2013 time frame. Potentially,follow-on experiments and equipment, Atkinson added, could lead to an ISRUproduction output at some serious level. This ability would supplementresources lugged from Earth andenable future crews to start "living off the land." OnDecember 4-6, NASA is holding its 2nd Space Exploration Conference in Houston,Texas--a status report meeting on implementing the Vision for Space Exploration. TheNASA lunar architecture unveiling is expected to answer the "why?" of returningto the Moon. Throughout this year, NASA has solicited input regarding thebenefits of lunar exploration from academia, the private sector and spaceagencies from around the world. Itwill be a notional strategy for both robotic and human exploration, with theintent to kick-start more discussion in and out of NASA circles, explainedGerald Sanders, ISRU project manager at NASA's Johnson Space Center in Houston.He coordinates all space resource work throughout the space agency. Upfor dialogue, Sanders told SPACE.com are human-piloted "sortie" flightsto the Moon - missions longer than the lengthiest Apollo stay of threedays, but not going into a lunar night. Thatis, sorties to the Moon's equator would be less than 14 days, but more thanthree days - likely around three to six day missions, Sanders said. There isalso desire to go to the lunar poles, to permanently or semi-permanently litlocales. "If you go to the poles, day is different there," he noted. Sortieswould reach "very unique places" that Apollo expeditions did not visit, Sanderssaid. More people would be on the lunar surface than Apollo, he said, and forlonger stay times. That means crews can investigate diverse locations--perhapseven the Moon's "far side" which is never visible from the Earth. Sortiesare also seen as a way to regain NASA's lunar legs, so to speak. Theseexcursions would not only groom astronaut skills and appraise equipment, butalso sharpen ground controller talent that would support the short sojourns. Anoutposton the Moon, on the other hand, would emplace people and equipment at onesite. "Itlimits you to a single location, but it gives you much more capability...moreredundancy...more living and lab space," Sanders said. Thereare major differences between a short sortie and the long-term outpost: Theamount of needed hardware and the ability to get a crew through a lunar night.To sustain a presence on the Moon will entail rotation of crews similar to thatdone on the International Space Station, Sanders observed. Expertsthat gathered here at the Space Resources Roundtable focused on ISRUcapabilities. Tohunker down on the Moon, astronauts can, for example, use lunar resources to make oxygenand water, create radiationshielding and building materials, as well as fabricate spare parts andtools. Forsustained human presence on the Moon, ISRU technology demonstrations shoulddefinitely be included and are a "must-have" in the very early stages of thelunar architecture. That'sthe view of Angel Abbud-Madrid, Director of the Center for Space Resources atthe Colorado School of Mines. "The early testing and demonstration of reliableISRU technology will significantly help to lower the cost, mass, and risk offuture missions," he told SPACE.com. ISRUresearch and technology are currently at the stage in which early demonstrationpayloads can be developed for inclusion on the first robotic missions to theMoon, Abbud-Madrid suggested. As a first step, he said, automated hardware canshowcase drilling and excavation techniques, as well as validate chemical processingideas. "However,it must be emphasized that this evolutionary approach towards the use of spaceresources will only be possible if demonstration payloads are considered at thevery beginning of the lunar architecture plan, Abbud-Madrid said. They will benecessary "to fully test the capability of the various ISRU technologies and toresolve any problems encountered with the operation of such devices on thelunar surface," he concluded. NASA's21st century return to the Moon is foreseen as being in full-access mode -having the capacity to reach anywhere on the lunar surface. "Ifwe are going to the Moon, it's a fairly diverse location of interest. You don'twant to limit yourself right up front," NASA's Sanders pointed out. Asfor ISRU, it can be portrayed as being in a chicken and egg limbo status. Ithas clear benefits, but gaining respectability and mission-critical stature isstill in the offing. Nevertheless,regarding the future of ISRU, Sanders is quick to respond: "I think it's more aquestion of when than if." Butas to when ISRU is introduced and at what pace remains a theme of discussion,Sanders continued. "Part of that is budgetary...part of it is convincing theusers that it's going to be available." ISRUhardware is now being built and tested, Sanders said. "It is first generationstuff, but we're getting past the viewgraph-engineering aspect."